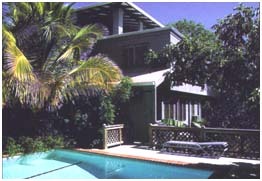 Cruz Bay Villas are four one bedroom condominiums completed in 1990 and updated in 2005. All have air conditioned bedrooms (and most villas have air conditioning throughout), ceiling fans, fully equipped kitchens, carpeted living/dining rooms with Henry Link furniture, bedrooms with queen sized beds, tiled floors and bathrooms, screened doors and windows, and wonderful views of the blue-green waters of the Caribbean. Gentle tradewinds, average temperatures of 83 degrees and privacy ensure a quiet, peaceful, and relaxing vacation. 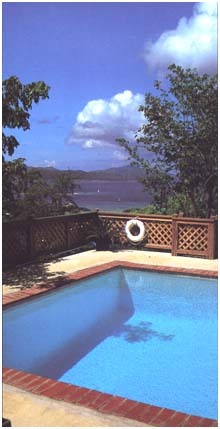 Cruz Bay Villas sit high on a hill surrounded by beautiful tropical landscaping. The shops, restaurants and nightlife of St. John are a ten minute walk, while the National Park beaches and hiking trails are a 5 minute drive. 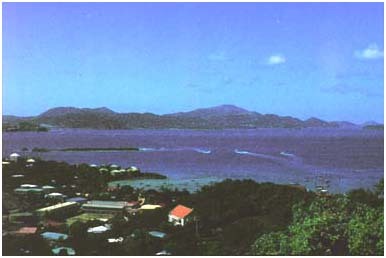 Cruz Bay Villas . . . intimate, private, and affordable; perfect for a comfortable vacation in paradise. Powder white sand beaches ringed by warm turquoise waters and emerald green tropical mountains. Here nature is preserved in its most pristine state in one of the United States' most beautiful National Parks. 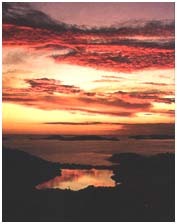 St. John ... The Caribbean's' most lovely jewel. Most recent update December, 2008.